In this issue, we talk to conductor and composer Hussein Janmohamed about using choral music to reframe the conversation about race in Canada; catch up with Professor Emeritus Robert Silverman as he reflects on a lifetime performing Beethoven’s “Emperor Concerto”; highlight a new scholarship from the Royal Over-Seas League UK; and introduce On That Note the new School of Music podcast that asks, How does music work? As a composer, conductor, and teacher, Hussein Janmohamed (BMus'96, MMus'98, MMus'14) has built a career using choral music to challenge cultural stereotypes and reframe the conversation about race in Canada. Growing up as an Ismaili Muslim in rural Alberta taught him that discrimination was an unfortunate fact of life, even in a country celebrated for its multiculturalism. And for Muslims and many other groups, he says, the issue is as pressing now as ever. “[W]e are in a society in which there are a lot of negative representations of Islam, not only from the media but from small minorities within the faith,” he says. For Janmohamed, challenging these stereotypes starts with combating self-stigma. After graduating from UBC with the first of two Master’s degrees, he founded the Vancouver Ismaili Youth Choir to help Muslim youth understand their dual and often plural identities. These are some of the big questions that the new School of Music podcast grapples with. Now available on iTunes, On That Note is a monthly deep-dive into the music you love — and music you may have never heard of. Join host Graham MacDonald and musicians and scholars from the UBC School of Music as they investigate everything from Beyoncé to Bach to Balinese Gamelan. Watch Nat Jay perform "What I'm Made Of." While the rise of Spotify and other music streaming services has been a boon for major artists like Taylor Swift or Drake, this new economic model has arguably made it harder for independent and emerging artists to make a living by selling their music. The alternative, says singer-songwriter Nat Jay (Minor’04) is to diversify. Jay has won national awards for her lyrical pop-folk songs and shared the stage with top Canadian artists like Juno-winner Dan Mangan. But instead of signing with a record label, Jay followed a less traditional path to musical success. She has built a thriving career by licensing the rights to her songs for use in TV and movie productions. Her songs have been heard on popular shows and movies across North America, including Heartland on the CBC and Awkward on MTV. And while she performs mostly in local festivals— like Vancouver’s Folk Fest and Spirit of the Sea Fest— she has amassed a following that stretches a lot further because of the exposure from these placements. “My sync placements made me realize it was actually possible to have a career and generate an income in the music industry,” Jay says. It is difficult to give Lucas Wong (BMus’04) a specific label or title. The UBC School of Music alumnus is a concert pianist and recording artist, but his career goals extend far beyond performance. He is also a university professor, a collaborator in a computer software project for piano students, a textbook writer, and the founder of the lecture-recital series, Mostly Debussy. Mostly Debussy was featured at the Roy Barnett Recital Hall in September, a concert in which Wong performed Debussy’s Pagodes from Estampes, as well as several selections from his collection of Préludes and Etudes. As part of the concert he also explained how the pieces work and what makes them so compelling. Estacio, Respighi, Brahms: UBC Symphony Orchestra with Student Concerto Competition winner Benjamin Hopkins. anyMOMENTnow: UBC Symphonic Wind Ensemble and Concert Winds perform music inspired by Gabrieli, Sweelinck, Bach, Karrick, Nelson and more. World premiere of Ana Sokolović’s “Evta”: Turning Point Ensemble and Ensemble Contemporain de Montreal (ECM+) perform the composer’s new violin concerto, along with works by Bauck, Torio, and Pieniek. Featuring UBC faculty and alumni. We Can Mend the Sky: Canadian premiere! UBC Choirs perform Jake Runestad’s powerful musical depiction of an immigrant’s journey, inspired by the poetry of 14-year-old Warda Mohamed. With a 400+ voice finale! MOMENTmakers: UBC Symphonic Wind Ensemble and Concert Winds perform Boysen, Lauridsen, Camphouse, Chance, George, Hailstork, Blackshaw, and Grainger. Dr. David Metzer’s new book, The Ballad in American Popular Music: From Elvis to Beyoncé, was published by Cambridge University Press. It is the first history of the ballad in recent popular music. Our semi-monthly Playlist column features music curated by our faculty, students, and staff around an interesting idea or theme. To celebrate the release of her excellent début, 17 Hoops, we asked singer/songwriter/pianist (and School of Music Communications Assistant) Colleen O'Connor to talk about music and "texture." This fall, Julia Chien (BMus ’14) won the Principal Percussion position with the Saskatoon Symphony Orchestra and the Principal Timpani position with the Kamloops Symphony, while Stephanie Bell (BMus ’14) is the new Second Flute with the Victoria Symphony. Catch Julia at Barnett Hall on Feb. 14th, 2018. "Northern Star,” a new composition by Dr. Dorothy Chang, débuted at the Calgary Philharmonic Orchestra in October. Dr. Chang composed the piece as part of a large-scale work for orchestra and dancers, in collaboration with four other composers, Vince Ho, Dinuk Wijeratne, Maxime McKinley, and Derek Charke, along with choreographer Yukichi Hattori. The performance is available online, along with a documentary that includes interviews with the composers. Standing Wave won the 2017 Western Canadian Music Award for Classical Artist/Ensemble of the Year at BreakOut West for their album New Wave. The ensemble includes UBC Music faculty members Vern Griffiths and Christie Reside, as well as alumni Allen Stiles (BMus ’84, MMus ’86) and A.K. Coope (BMus ’90). The recording includes contributions from composer Michael Oesterle (BMus ’92) and producer Will Howie (BMus ’04). Dr. Robert Taylor recently completed a one-week residency at the Singapore American School, where he worked with band students in grades 6-12, provided professional development sessions for music faculty, and guest conducted a program of 13 works with five different ensembles. Azura Quartet's Mo Miao, Mia Gazeley, and Haley Heinricks. 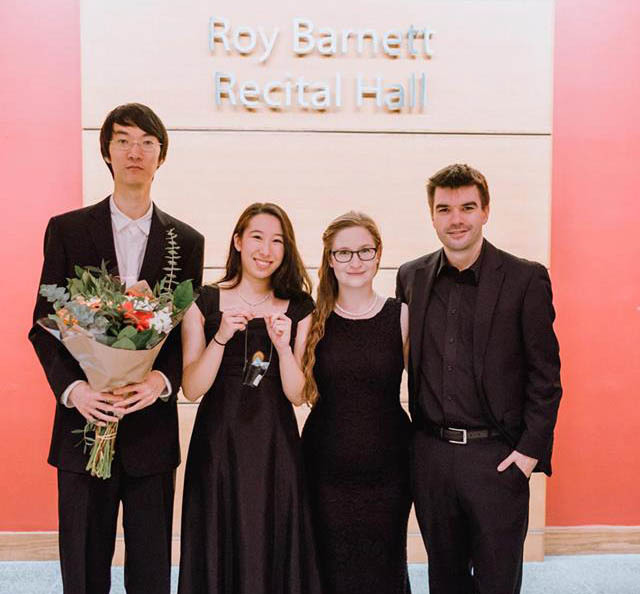 The Azura Quartet, featuring School of Music students and alumni Mia Gazeley (BMus student), Mo Miao (BMus student), Chinley Hinacay (BMus ’17), and Haley Heinricks (BMus’17), won first prize and $1,500 in the Chamber category at the 2017 National Music Festival in Ottawa, Ontario. Alumnus Ryan Hofman (MMus ’17) won second place and $1,000 in the Voice category. Congratulations to all! Recent graduate Lorna Yeates (BMus’17) has generously donated a new hydraulic piano bench for use in Roy Barnett Recital Hall. Artist Pnina Granirer has donated a work of mixed media on paper, entitled "Solo (1977)", in memory of piano faculty member Mary Tickner, who dedicated her life to music and her students. It graces the chamber music rehearsal room, located on the 4th floor of the music building. There are two other works created by Ms. Granirer that may be seen in the foyer of the Old Auditorium as well.